Henrik Schwarz has long been seen as a different kind of electronic artist, not quite fitting the mould of what you would expect from someone who has dedicated the majority of their career to house and techno. With his recent Schwarzmann project however, he has pushed the boundaries more than ever before, arguably redefining what it means for an electronic artist to perform ‘live’. Here, Defected’s Greg Sawyer examines the finer details of Schwarz’s extraordinary career: Back in the day – and I’m talking a yawning chasm of 20 or more years ago if your memory can cope with that – producers didn’t just make records in order to DJ. Nowadays its part and parcel of the electronic music business that to make the leap from obsessive hobby into career, you’ll almost certainly need to DJ, and while some undoubtedly still produce for genuine love of the music, for a healthy proportion studio time simply allows them to do what they’re always wanted to do at clubs and festivals around the world. When Henrik Schwarz started out on his career, quite the opposite was true. Schwarz never saw being a DJ as the goal, more a necessary step: it was the music that interested him. DJing was – at that time – simply the closest he could get to it. “I always wanted to make my own music, that’s something I was always sure about” says Schwarz. “But for some reason I never learned an instrument. DJing was just me trying to get a close as possible to the music I loved”. More often than not, this involved long drives to bigger towns and even into Switzerland to find the UK and US imports that made up a lot of his early, hip-hop leaning tastes. These days Schwarz doesn’t DJ, but it’s not something he misses. “I was just thinking about DJing just recently as I have thousands of records at home still. It would be nice to play them of course, because I always loved DJing, but it would be so much work to get into it again. I would want to do it really seriously and I would need half a year to listen and to just prepare a set that nobody else would play. 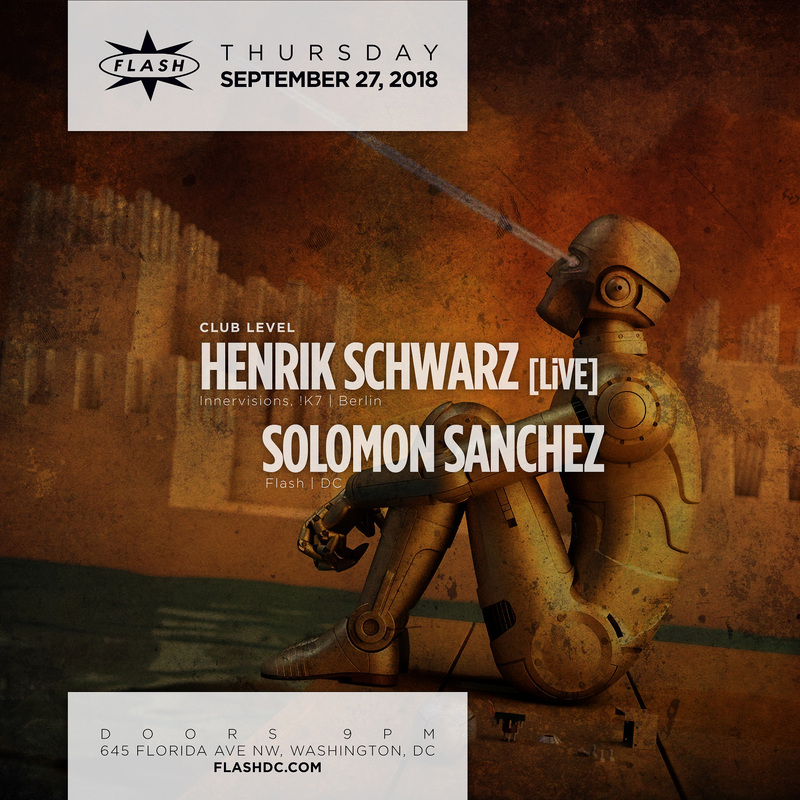 Maybe I would do it at some point, but at the moment there would be no time for it.” That Schwarz would have no time for rediscovering his former life as a DJ is testament to just how successful he has been in establishing himself as not only one of the foremost electronic producers of his time, but as a hugely in-demand live act as well. Schwarz has dedicated almost his entire life to electronic music production, usually operating within the often interchangeable parameters of house and techno; something that is perhaps unusual for someone as obviously talented and creative as him. To its critics, the 4/4 structure of these genres are a restrictive and stifling, eschewing inventiveness for the sake of keeping the dancefloor moving. But for Schwarz, quite the opposite is true. “I have felt total freedom in electronic music because the 4/4, for me, is the bridge into the unknown” he admits. “You can do anything in between two bass drums, and they hold it together. You can make the craziest sound and put a bass drum there and everyone loves it! That’s how I’ve always felt about it, it can be totally open.” It’s an approach that you’d have a hard time refuting when you consider its results. His discography is – in a word – stunning; a rich vein of quality running thickly though it. And yet as consistent as it is you’d struggle to find the sound, technique or approach that identifies it as a Henrik Schwarz production. While some rely on templates, modifying previously well-received harmonies or drum patterns to create their next ‘hit’, Schwarz starts with a blank canvas, with the result that each record is unique; a completely independent addition to one of the most impressive bodies of work in electronic music. 1 Now that the entry into music creation is so low – a significant change from when he first started out – does he think that people pay too much attention to how music is made, rather than the end result? “I think they pay so much attention because it has changed a lot; it’s no longer just a very limited amount of people that make music. Everybody wants to be a part of this huge business and computers have made that possible. But I think that’s a good thing because we now have to deal with technology all the time: making music is a way of dealing with technology at a very abstract level.” Schwarz’s first foray into making his own sounds came when he was still very young. “The first thing that really interested me was my first tape recorder which I got when I was about nine” he recalls. “When my brother also got one a couple of years later I started putting them on top of each other, using a microphone to record them because I didn’t know you could put them together through cables. That is sort of how things started. When computers showed up I thought they could be something that I could use to make music.” An invaluable instrument in Schwarz’s career, computers have allowed electronic artist to perform ‘live’ – to greater or lesser degrees, but few have developed the idea of live electronic performance as he has, especially in regards to his Schwarzmann project. Alongside Âme’s Wiedemann, Schwarz has torn up the rulebook in terms of what can be expected from a live act, creating something that is arguably more creative than any traditional band and vastly more versatile than the most eclectic DJ set. “Schwarzmann“ is an idea that Frank and I had a couple of years ago” he recalls. “We’ve been playing together for more than ten years now, so we wanted to try and develop a proper concept instead of just doing a back to back live show.” That concept was to play live covers of their own music, resulting in a set that is absolutely adaptable depending on setting, the mood of the audience and a thousand other factors that may come into play. “Musically we have a very strong connection so in the beginning it was an experiment to see what happens when we didn’t prepare anything. It’s totally untypical electronic” he concludes. Though a band might have different set list depending on the location or crowd, they are ultimately constrained by the songs they have written, a little improvisation notwithstanding. Similarly, a DJ can only play the records he brings with him. With Schwarzmann, the possibilities are boundless, whether that’s thumping, freeform techno at Melt! Festival or an hour of ethereal beatlessness at London’s Oval Space last year. “Maybe in electronic music it’s not often when things happen unprepared and this makes it more unique: real time record making” he suggests. The longer Schwarz’s career goes on, the more it seems he is veering towards experimentation; pushing back boundaries that for some are seen as a comforting box to sit neatly within. Does he feel that is the case? “As I’ve been doing this for a long time I felt I could try a few things out, still play my stuff of course, just maybe stretch a little further out and see what’s there.” It is this inquisitive attitude that has made him such a peerless – and popular – artist; a desire not to settle for the tried and tested, but to stretch further and deeper into what is possible. “In a way I’m just interested in what I can add to my computer. How does it work? How can I connect it to other worlds, and in a way it feels very natural for me because I’ve had a feeling I’ve done that all the time. I’ve always tried to bring things into the computer from outside, bringing sounds that normally don’t belong to electronic music into electronic music, so now maybe it’s time to turn that around”.